Use YEGPIN as an opportunity to promote or sell a game at YEGPIN. If you have your machine advertised on Kijiji, Craigslist or Pinside what better way then to try to sell your machine there at the event itself. A potential buyer will have an opportunity to play test and personally view the machine. This allows you as the seller leverage as there may be many potential buyers at the event. If you would like to place your machine in the expos market place, please indicate this on the Bring a Machine form. We will supply a pre-made YEGPIN seller’s card for you to fill out and place on your machine. Machine(s) shall be in full working condition, on free play and available to play throughout the event. The machine will have a special seller’s card which shows the price of the machine and the contact name and number of the owner. Potential buyers are to deal directly to the seller and finalize any transaction directly with them. 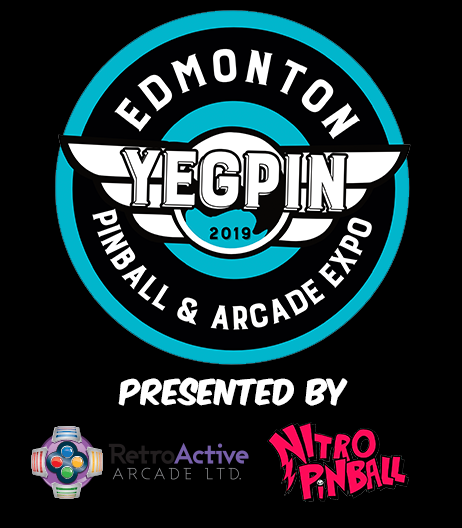 YEGPIN organizers will only release a pinball machine on the seller’s consent. Marketplace machines are not eligible for ‘bring a machine’ rewards. Marketplace machines are subject to the same terms and conditions that ‘bring a game’ machines are. Q. What if I sell my game while it’s there, can I turn it off? The expo floor is intended as a place where games are brought to share with others. YEGPIN staff reserves the right to keep all games on the main floor powered on for the duration of the event, unless a technical issue has arisen, in which case we will follow those procedures. If you plan on selling games, please inform the new buyer that there is a commitment to leave that machine on the floor until at least the end of the show day, preferably until the YEGPIN is over. Any exceptions need to be approved by the YEGPIN Event Director. Q. Are there any fees for listing my game at the expo? No, the reason for the expo is to bring exposure for pinball and arcade games to people who do not necessarily know about the history of the machines. The marketplace is intended to facilitate this process. All we ask is that if a machine is sold, consideration is given to provide a small donation to the expo for helping you in facilitating the selling of your machine.